We reported earlier this year on Canada’s revised regulations for its International Student Program (ISP). The new regulations have now come into effect – as of 1 June 2014 – including an important change that only students enrolled at designated institutions will now be able to apply for a study permit (that is, an international student visa) for Canada. In order to apply for a study permit, students will now require a letter of acceptance from a designated learning institution. Students will also need to provide an official Designated Learning Institution number for the institution they plan to attend on their study permit application. Each province or territory in Canada is responsible for determining which institutions are eligible to receive international students. The process of designating institutions is ongoing but Citizenship & Immigration Canada (CIC) has just released the initial list on its website. The official CIC list of designated institutions and schools is searchable by province and territory, and also by city or institution name. 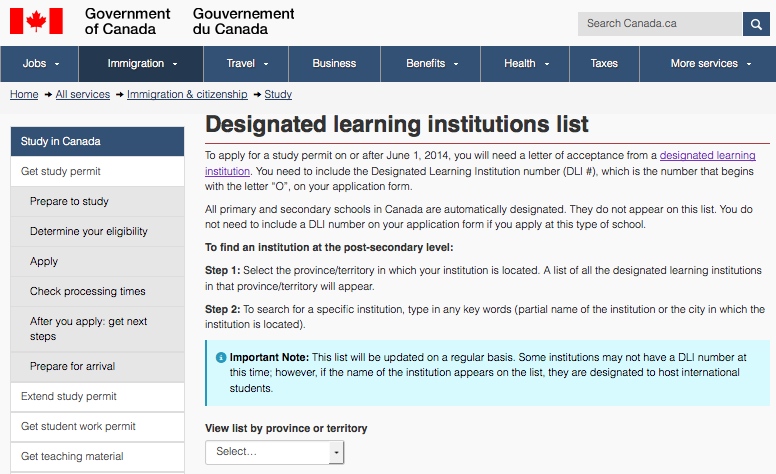 As of 19 June 2014, there are 1,010 designated institutions across Canada. The majority are found in the provinces of British Columbia (272), Ontario (420), and Quebec (176), but every province and territory, with the exception of the northern territory of Nunavut, has at least one (and often many more) designated institutions on the list. These schools do not appear on the CIC list, nor do they have an assigned Designated Learning Institution number. However, a letter of acceptance from a Canadian primary or secondary school can nevertheless be used as the basis for a study permit application. As with all other provisions around Canadian study permits, the newly enacted regulations for June 2014 apply in cases where students intend to study for more than six months. CIC advises that students do not need a study permit if they plan to take a course or programme in Canada that lasts six months or less. For additional background on the amended regulations for Canada’s International Student Program – including expanded work opportunities for study permit holders – please see a detailed summary in our earlier post. This entry was posted in Canada, Higher Education, Immigration, Most Popular, North America, Regions and tagged college admissions, visa processing, student enrolment, colleges with international students, student mobility.